Well well well. Let’s dive in here, shall we. First off, Shaft has a 2” melee zone, which is instantly a strong look for a captain. His stats are generally pretty great, with his 4”/6” MOV effectively becoming 7”/9” with Secret Tunnel, plus TAC 6 and a 3/8” KICK putting him right up there with some of the best striker models in the game. He does have below average defensive stats, at 3+/ARM 1, however. Moving onto his playbook, one of the major themes of the Guild comes through here. While he’s not going to be dodging at all, every result with a push is momentous. His damage is pretty low for a captain, again reinforcing his role as a model who’s gonna be focused on the ball. He does have some momentous damage results, however, just in case he needs to pivot to a 2/2 playstyle. Really, the big result worth talking about is the momentous tackle/push on column 1. This is an absolute stonker of a result, allowing him to steal the ball and get the enemy model entirely out of the way in the process. Moving on to his character plays, Weak Point is an old staple, reducing an enemy model’s ARM by one is always pretty solid. His second character play, Lodestone, is totally unique, however. It targets an enemy model and if it hits, Shaft’s player has a choice to make. All models within 4” of the target enemy model either get pushed 2” directly towards the target, or directly away from the target. This provides a tonne of options, obviously. Use it to shut down a counter charge lane, to push a scary enemy model out of threat range, to pull Shaft into melee range of an enemy model, or a dozen other ways. Do note the original target of the play doesn’t move either way. This is a really cool, unique play that you’ll discover more uses for as you play the Miners for longer. Finally, Shaft has 16 HP. Shaft of course has Secret Tunnel, as a Miner (THE Miner, even). He also has Tough Hide. This explains his 3+/1 defensive profile with 16 HP, he’s a pretty tough lad with Tough Hide helping keep him in the fight a bit longer. With that low defensive profile, he’s still going down pretty fast if he gets knocked down though, so be wary of that! 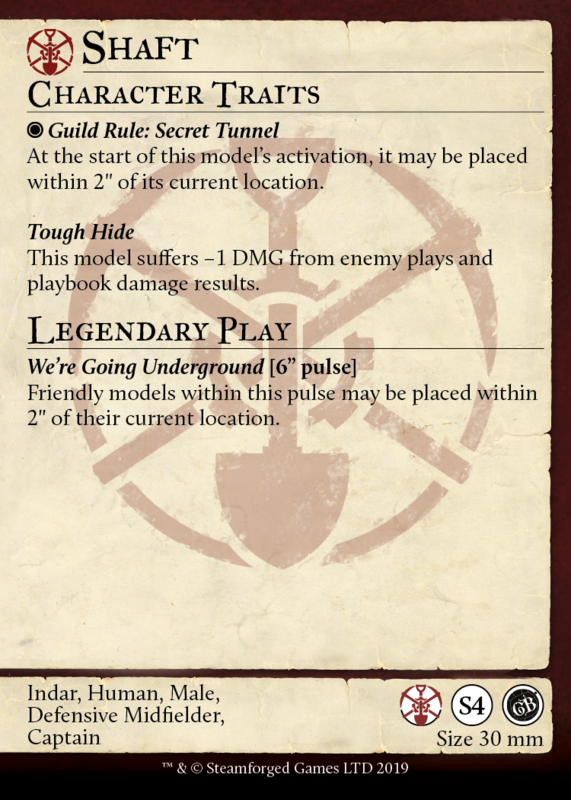 Finally, Shaft’s Legendary Play, We’re Going Underground allows every friendly Miner’s Guild model within 6” to be placed within 2” of their current location. This is huge, allowing a massive team wide shift of focus. Use it to get some gang ups on an enemy model, to pull a friendly model back out of danger, or even just to get the place on Shaft himself to extend his goal threat. Much like Lodestone, the range of uses for this ability is pretty much infinite. There’s almost never going to be a situation when this Legendary Play isn’t useful, it’s just a matter of deciding when you want to use it for the best effect! And that concludes our look at Shaft! Let us know what you think about the Foreman on our social media platforms! If you like the look of the big man, pre-order your Miner’s Guild: Dig for Victory box here! Thanks for reading, we’ll be back next time with a look at the Heartfire of the Miner’s Guild, Mule AND Fissure, the Thunderous Behemoth! !